Let’s check the possible reason one by one. First, if user met a case like that the Anyscene said speaker and voice detection are not available, it was normally. Because TT520PW don’t have speaker and voice Detection function. Second, check the volume of microphone, make sure the volume of microphone are not the minimum volume, Please refer to the below figure. Third, goto the APP control panel, there is a speaker icon. Turn it on by tapping the speaker icon (Please refer to the below figure), if user can hear the voice, that’s all the devices are working well. 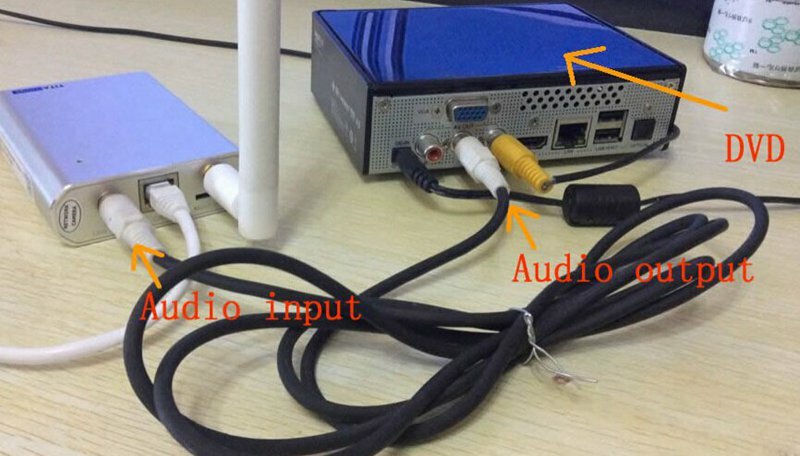 Please prepare other audio devices such as DVD, Zune or Any other music player, and then connect the spund pick device’s audio output to the camera audio input RCA Male Adapter with a audio cable. Please refer to the below figure. If the anyscene can output voice, means that the camera has no problem. So user should check the sound pick up device. Now prepare a SPEAKER, connect the sound pick up device’s audio output BNC to the SPEAKER audio input RCA Male Adapter, please refer to below figure as a connection. If the SPEAKER can’t output the voice, May be there are some problems in the Sound Pick-up Device, user should contact that device seller to ask for an assistance. Solution for problem "Error loading player no playable source found"
How can you do when your camera get multi color vertical bars for your video? What kind of sound pick up device should I purchase? Why does the camera make a loud noise and echo when I enable the audio?